RV kits include all the parts needed to build a complete airframe. The builder must provide the engine, propeller, instruments, avionics and upholstery. All RV kits have been reviewed by the FAA and have been found eligible for licensing in the Experimental Amateur Built category. This means that the fabrication work we do on the kit parts is less than 50% of the total required to complete the aircraft, and that at least 51% of the work remains for the kit builder. All RVs, whether built from a Standard or a QuickBuild Kit, are constructed using the same parts. The difference between the kit “styles” is the degree to which these parts have been pre-assembled when the builder receives them. The Standard Kit is perfect for the builder who enjoys the process and is working on a limited budget. Using some combination of the several time saving options available, he or she can balance the time/money equation to suit their circumstance. If the builder has a little more to spend, and wants to fly even sooner, then the QuickBuild Kit is an excellent value. Please visit the QuickBuild page for more information on our QuickBuild kits. The Standard kit is far more than just a “materials package.” When the kit is shipped, any work requiring mechanical equipment not readily available to the homebuilder is already done. If a part needs to be sheared, bent, rolled, pressed, hydro-formed, heat treated or welded to be ready to use, it has already been done at the factory. The builder’s job is primarily to assemble the parts, not make them. We do not do the small trimming and adjusting jobs which the average homebuilder in the average shop can do just as well as we can. Leaving this work to the homebuilder helps keep our labor to a minimum and the cost of the kits at a reasonable level. Because of the volume of material we buy and the efficient way we run our shop, the price of our kits is not substantially higher than an individual would pay for the raw materials. The builder is spared not only the necessity of buying expensive tools and making form blocks that would be used only once, but also the tedious and often frustrating job of shopping piecemeal for materials and parts and the waste of having to purchase larger quantities than actually required. Although RV kits are quite complete and very successful, you’ll find that Van’s works to continually improve them. For example, over the years pre-drilled spars for the RV-4 and RV-6 have became (and completely assembled spars an option), bell cranks, empennage hinges and many other small parts that builders originally fabricated themselves are now supplied ready-to-install. Wing and floor ribs come with all the lightening holes already finished. Many of the steel components are now powder-coated at the factory, sparing the builder the tedious task of preparing, priming and painting them. But the biggest improvement – and it’s one that some might call it revolutionary – in Standard Kits is the introduction of “matched-hole” components. Made possible by advances in tools and techniques, components are now supplied with all the fastener holes punched — and punched so accurately that the need for assembly jigs is eliminated! When you start cleco’ing the parts together and the holes line up, the components must be straight! 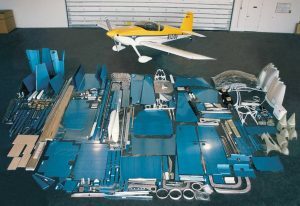 RV-7/7A, RV-8/8A and RV-9A, RV-10 and RV-14/14A Standard Kits as well as the RV-12iS are completely matched-hole. Since it is not possible to “back-in” the matched hole concept to kits that were designed before the tools were acquired and the techniques learned, the RV-3 and RV-4 must be content with pre-punched wing skins, which are used as templates to match-drill the underlying ribs and spars. RV aircraft are marketed in four sub-kits: Empennage, Wing, Fuselage, and Finishing. There is no price penalty for buying incrementally; and sub-kits may be ordered in any combination. Almost all the kits sold in the USA and Canada are ordered incrementally (foreign buyers may find it advantageous to order the whole kit at once to save on shipping and importing costs). The advantages of spending money in smaller chunks and not having to find storage space usually outweigh the disadvantages of having to plan ahead. The sub-kits are intended to be built in the order listed. The sequence may be varied slightly, but, because of the way the parts interface, the wings must be built before the fuselage. All individual parts of each kit are also available separately. On the following page is a brief description of what each standard kit contains. All skins are pre-cut, bent and rolled. RV-7/7A, RV-8/8A, RV-9A, RV-10, RV-12iS and RV-14/14A skins are pre-punched for all rivet holes. All spars are formed, essentially ready to install. All the rivet holes for the skins and ribs of the RV-7/7A, RV-8/8A, RV-9A, RV-10, RV-12iS and RV-14/14A kits are punched… You can cleco entire assemblies together without picking up a drill! All ribs are press-formed. RV-7/7A, RV-8/8A, RV-9A, RV-10, RV-12iS and RV-14/14A are matched punched to the skins and spars. Spar re-enforcement strips are milled to correct size and taper. RV-7/7A, RV-8/8A, RV-9A, RV-10, and RV-14/14A strips are pre-punched to match the spars. Hinge brackets, control horns and other steel parts are supplied ready to install. Premolded fiberglass tips for all surfaces are included. All necessary nuts, bolts, rivets, washers, bearings, etc., are included. Complete, gold anodized main spars are standard on the RV-3, RV-7/7A, RV-8/8A, RV-9A, RV-10, and RV-14/14A. A gold anodized fuselage center section bulkhead, precision matched to the main spars, is standard on those kits as well. 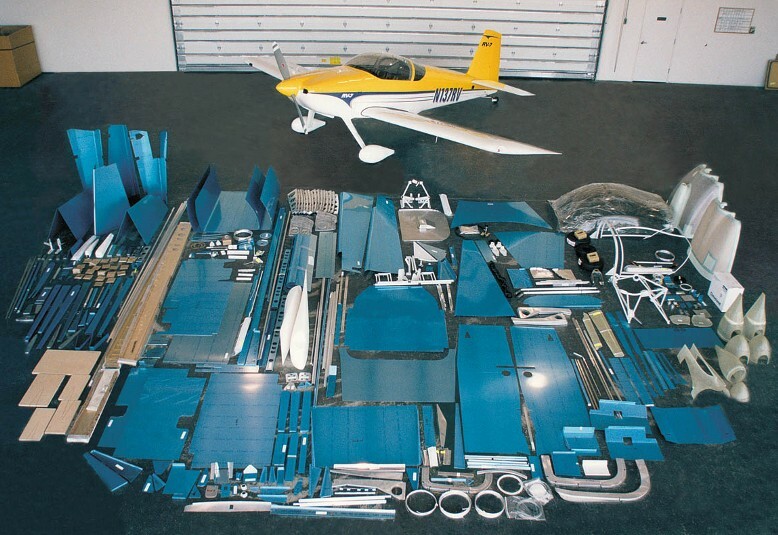 RV-4 and RV-6 spars are a pre-drilled kit and require assembly, but complete anodized spars are available as an option. All the wing and control surface ribs are hydroformed to shape and include lightening holes (except the RV-3). On RV-7/7A, RV-8/8A, RV-9A, RV-10, RV-12iS and RV-14/14A kits the ribs are pre-punched to match holes in the skins and spars. Wing skins are sheared to size. Leading edge and fuel tank skins pre-bent. Except for the RV-3, all kits include pre-punched wing skins. Aluminum tube, steel tube and aircraft hardware are provided for control pushrods, pitot tube, and fuel lines. The aileron bellcranks, fuel tank access covers and other similar parts are stamped to shape and ready to install with only minor clean-up (except RV-3). Aileron mounting brackets are made of aluminum and steel, pre-formed and riveted; ready to install. All nuts, platenuts, washers, bolts, screws, rivets, pop-rivets & tube fittings are included. All skins are supplied accurately sheared and formed. All RV-7/7A, RV-8/8A, RV-9A, RV-10, RV-12iS and RV-14/14A fuselage skins are pre-punched. All fuselage bulkheads and ribs are press-formed. Extruded angle for longerons and stiffeners. Formed aluminum angle for skin stiffeners. All the pre-cut and bent aluminum panels and channels used in the cockpit and baggage area are supplied. Ready-to-install rudder cables with stainless steel fittings. All steel parts such as longeron brackets, control sticks, rudder pedals, flap controls, tail wheel fork, are welded and in most cases, powder-coated as well. Brake master cylinders, lines, and fittings are included. All nuts, platenuts, washer, bolts, screws, rivets, pop-rivets, tube fittings needed are included. Plexi-glass canopy is supplied. Light gray tint is standard; clear available on special order. Welded canopy frame is supplied powder-coated. Fiberglass cowl and mounting materials are included. Engine mount is pre-welded and powder coated. Main gear legs (RV-3, RV-4, RV-6, RV-7). Includes axles, wheel nuts, spacers and installation hardware. Fiberglass spinner with aluminum mounting plates. Fiberglass landing gear and wheel fairings. New 5:00 x 5 wheels and brakes with hardware. All brake lines and hardware. Wing root and empennage/fuselage fairings. Nosegear leg, fork, and wheel assembly on RV-6A, RV-7A, RV-8A, RV-9A, RV-10, RV-12iS and RV-14/14A.